By allocating $1.55 million to nonprofits, the fund has helped people from more than 60 different countries as immigration-related arrests and deportations have risen. 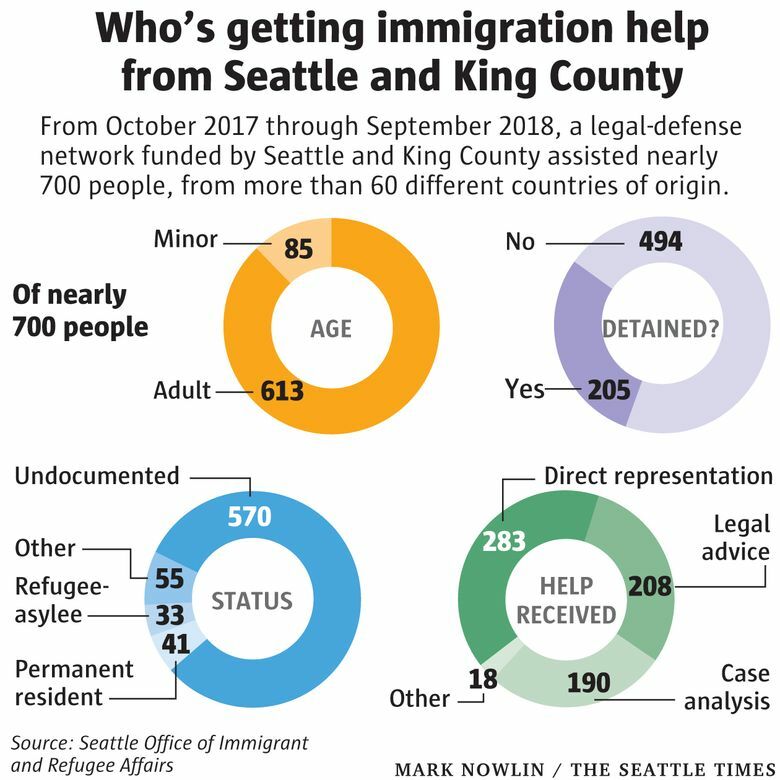 After President Donald Trump won election and said he would crack down on undocumented immigrants, Seattle and King County leaders vowed to resist by paying lawyers to protect local immigrants from deportation and loss of status. Since then, a network launched by the city and county has served hundreds of adults and children, providing people hailing from dozens of countries with legal advice, case analysis and representation in immigration court. 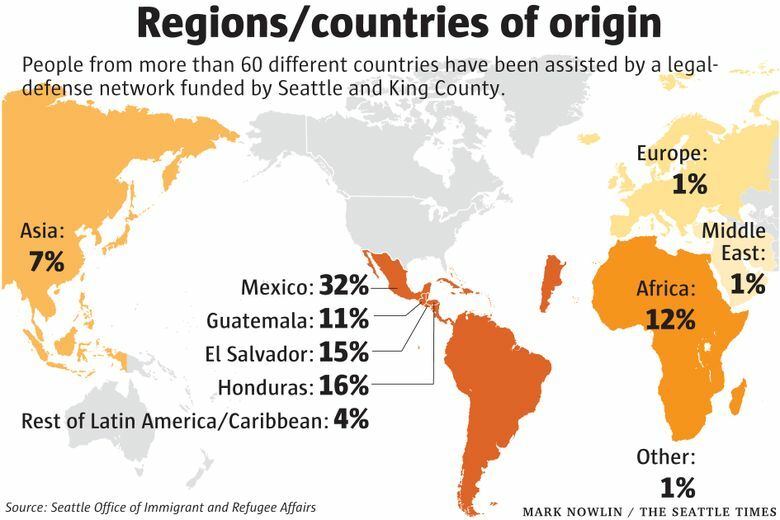 By allocating $1.55 million to nonprofits since October 2017, the Seattle-King County Immigration Legal Defense Network has pushed back against ramped-up enforcement by the Trump administration, say local leaders now considering how much to budget for the network next year. City Councilmember M. Lorena González urged her colleagues last week to support the network with more money, citing the president’s recent vow to end birthright citizenship. Trump cannot act alone to do that, experts agree. Unlike people charged in criminal courts, who are guaranteed the right to be represented by public defenders when they can’t afford lawyers, people charged with immigration offenses must hire their own lawyers. “In many situations, people have to do without legal representation and the results … can be devastating,” Cuc Vu, Seattle Office of Immigrant and Refugee Affairs (OIRA) director, told City Council members in September. Through September, the network had served 699 immigrants from more than 60 different countries, according to OIRA. More than 75 percent of the clients were immigrants from countries in Latin America or the Caribbean, including Mexico (32 percent), Honduras (16 percent) and El Salvador (15 percent), while 12 percent were from countries in Africa and 7 percent were from Asian countries. Most of the clients were adults and a majority weren’t detained, 85 were unaccompanied minors and 205 were detained by the government. Through September, 283 clients had received representation in court. The remainder had been provided with case analysis, legal advice and other services, such as counseling. Many clients need mental-health services to bolster asylum claims or cope with trauma, and the network has helped with those costs, Vu said. The vast majority of the clients served through September were undocumented, and almost 300 had decided to seek asylum. To receive help from the network clients must live or work in Seattle or live somewhere else King County. OIRA lacks data on immigration enforcement specific to Seattle and King County but knows the picture has been changing in Washington, Oregon and Alaska. Those states saw a 25 percent increase in arrests and a 88 percent increase in deportations in approximately the year after Trump’s election, including a 210 percent increase in arrests and a 29 percent increase in deportations of people without criminal convictions, according to U.S. Immigration and Customs Enforcement statistics. The numbers show how immigrants are undergoing “a period of unprecedented attacks” by the government, Vu told González’s committee, which oversees public safety and immigrant issues. The government seems to be seeking more deportations of women than in the past and people with immigration statuses that previously were considered secure have come under new scrutiny, Vu said. The Trump administration in June announced a push to investigate and denaturalize immigrants suspected of lying in order to become citizens. “Even U.S. citizens and lawful permanent residents are not safe,” Vu said. For 2018, the city-county network allocated money to seven nonprofits — three legal-services providers, such as the Northwest Immigrant Rights Project (NWIRP), and four “community navigators,” such as the West African Community Council. The former are carrying out the core work, while the latter are connecting the providers with potential clients. NWIRP’s $1.2 million share has helped the nonprofit hire two attorneys in Seattle and a legal advocate in Tacoma, where an immigrant detention center is located, said executive director Jorge Barón. The organization’s clients have included a woman from El Salvador who was detained by immigration authorities this year despite having U.S.-citizen children and having lived in the country for decades, Barón said. “She’s been released on bond and is back in the community,” he said. To start the network, Seattle contributed $1 million and King County contributed $550,000. Mayor Jenny Durkan in September proposed a 2019 city budget that would send $795,000 to the network in 2019 and $810,000 in 2020. The mayor’s budget, now under consideration by the City Council, assumes the county would contribute an equal amount. The county has committed $819,000 per year through 2023 for immigrant legal services, but leaders have yet to decide whether to continue partnering in the same way with the city, said Alex Fryer, a spokesman for County Executive Dow Constantine. In the meantime, González has proposed that the council add to the mayor’s proposed allocation. Under González’s plan, which garnered unanimous support from her colleagues this week, Seattle would spend $1 million on the network next year. The council member has yet to say what cuts would be made elsewhere in Durkan’s budget to pay for the increase. Five clients served by the network have won their cases outright and four have been deported, according to OIRA. Nearly all the rest have yet to see their cases resolved because immigration matters can take a long time. The nonprofits took a risk by signing up for the work without knowing whether the city and county would continue to set aside money, Barón said. “We’ve made a commitment to the people we’re serving,” he said. NWIRP subcontractor Colectiva Legal del Pueblo has taken on a number of tough cases, serving clients who have been homeless or have criminal records, said Rita Maria Espinosa Arguello, supervising attorney. In some instances, the best the Burien-based organization can do is win a bit more time for people to spend with their families, she said. Arguello worked to stop the deportation of an undocumented immigrant who was detained in Tacoma for seven months, allowing him to plan his stepdaughter’s birthday party this month. But he still could be taken away, leaving his U.S. citizen wife alone, she said.